The card reveals for Hearthstone's Kobolds & Catacombs expansion are underway, so Shacknews takes a look at more card reveals from the past couple of days. Analysis: Even with Dragon synergy, it's hard to imagine Hoarding Dragon in any kind of constructed deck. There's far too much risk of going up against a class that can utilize the Coins to their advantage, like a Miracle Rogue, Highlander Priest, or Quest Mage. As nice as a 5/6 body on Turn 4 sounds, it's not worth giving the opponent that kind of firepower. 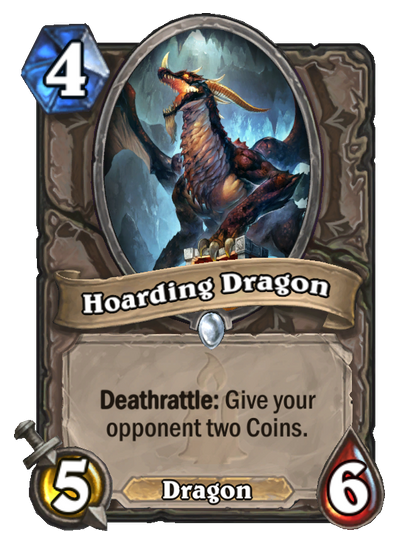 Where Hoarding Dragon will shine is as a pull from Evolve. Other than that, I wouldn't expect to see a whole lot of this card. Taunt. Deathrattle: Summon three 1/3 Demons with Taunt. 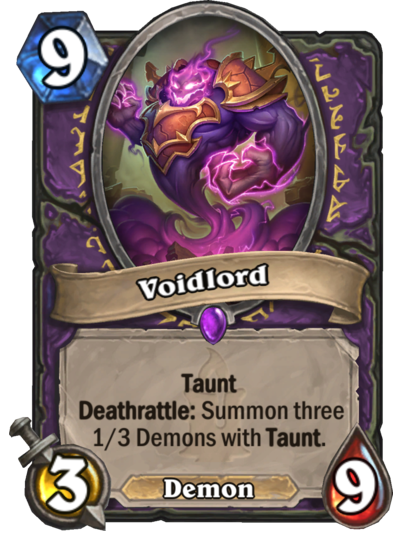 Analysis: This is a potentially great card for Warlock, as Voidlord is essentially Taunts on Taunts on Taunts. It is a very tough sell for 9 mana, but assuming it isn't Silenced, it should provide some valuable protection from the face. And it's something that can be resurrected by both Bloodreaver Gul'dan and N'Zoth, the Corruptor, making it a doubly appealing option. I'd actually like to see this paired up with Krul the Unshackled in a Highlander deck, because if the board is cleared for any reason, the Death Knight card can simply bring both of them back. But while Voidlord might find a good home in a Standard, I fully expect this to become a staple in Wild decks. 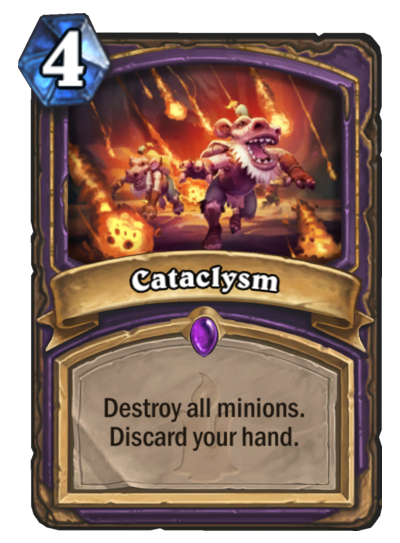 Voidcaller will make this into a great tool for any Warlock deck. Battlecry: Shuffle 3 Ambushes into your deck. 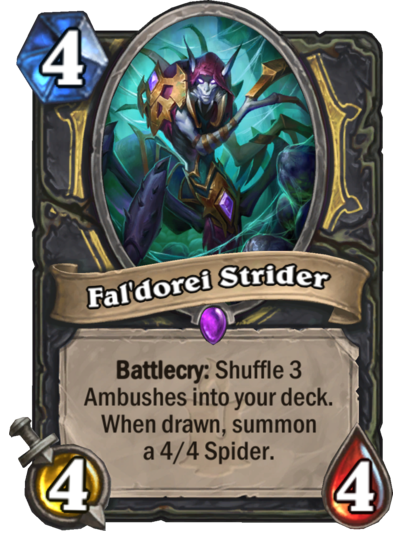 When drawn, summon a 4/4 Spider. Analysis: Remember the Rogue's old Beneath the Grounds spell? This is a slightly more expensive version of this card, but it also comes with a 4/4 body. That makes this a pretty good Turn 4 play for any Rogue deck. But more than that, this is going to be an A+ Arena pick for all Rogue players. Having three 4/4s ready to go in the Rogue's deck is beyond handy in a resource-intensive mode like Arena. This is great for the tempo game and should be selected every time it pops up. Taunt. Battlecry: Summon a random 2-Cost minion for your opponent. Analysis: This is a bigger version of Hungry Dragon, right down to the minion it summons for the opponent. 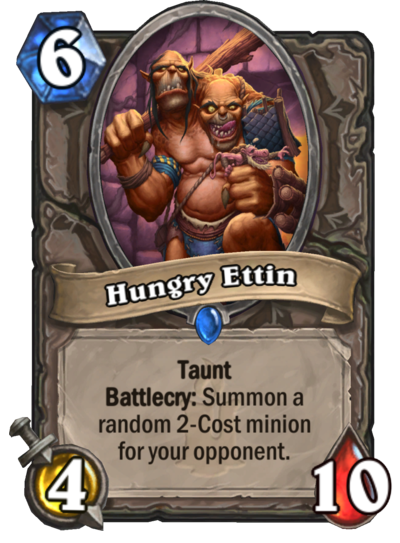 The difference is that Hungry Ettin has Taunt, which sounds nice on paper. Unfortunately, there are so many valuable 2-Cost cards, it's all too easy to have this play backfire. It's bad enough to give your opponent a Sorcerer's Apprentice, Radiant Elemental, or even Doomsayer. But this expansion has seen some awesome 2-Cost minions revealed so far and that's going to mean the possibility of summoning one of those on the other side with this guy. It's just not worth the risk. Analysis: There's really only two reasons to play Cataclysm. One is either as an absolute last resort to clear the board. The other is to complete the Lakkari Sacrifice quest. So really, this spell is mainly for Quest Warlocks. The good thing is, this will help fill that Quest requirement fast, possibly even in time for the Turn 5 Nether Portal play. The trouble is, there's potential to have taken a lot of damage in that time. So unless there are some healing minions in that deck, this is a big roll of the dice. It's a big gamble, but so is Quest Warlock, in general. And fortunately, Cataclysm makes this deck feel a lot more viable, especially if there are some Silverware Golems available. Analysis: Now here's the first instance of the Recruit mechanic that feels truly impactful. 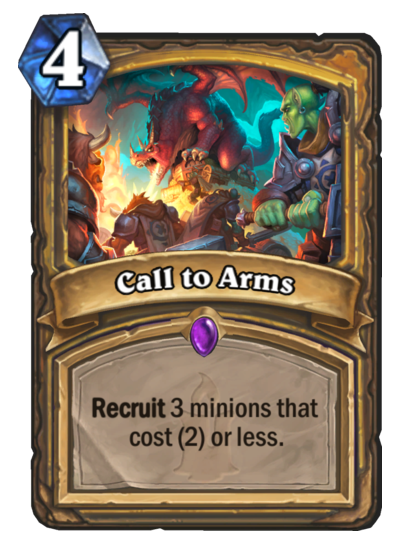 Call to Arms is a wildly powerful addition to the Aggro Paladin lineup. There is a very high number of useful minions that run for 2 or less, with Righteous Protector leading the way. And since this is a 4-mana spell, there's a chance Prince Keleseth will have already hit the board, meaning those Recruited minions will be boosted. Paladins are going to strike a lot faster in the new meta, if this card is any indication, so be sure to have answers ready. And because this will flush out the lower-cost minions from the deck, it'll mean they'll be able to strike more efficiently and more on curve, too. This is a big-time spell for Paladin players. Battlecry: Cast each spell you cast on your minions this game on this one. Analysis: Call to Arms might be a good card for Aggro Paladin, but how about something for Control Paladin? Boy howdy, is this card ever for those players. Even Paladin players that don't necessarily play the Buffadin style have likely used at least one buff spell. Don't try to act like you haven't used Spikeridged Steed at least once. Well, this ensures that Lynessa enters play with that spell restored and applied. At worst, Lynessa can be a 2-mana Silver Hand Recruit blended with a 6-mana Spikeridged Steed. That's still some insane value and that, alone, makes her worth the play. In fact, Spikeridged Steed is one of the sole reasons that Lynessa becomes worth packing into a deck, since the Paladin's other buffing spells are pretty mediocre for this particular case. 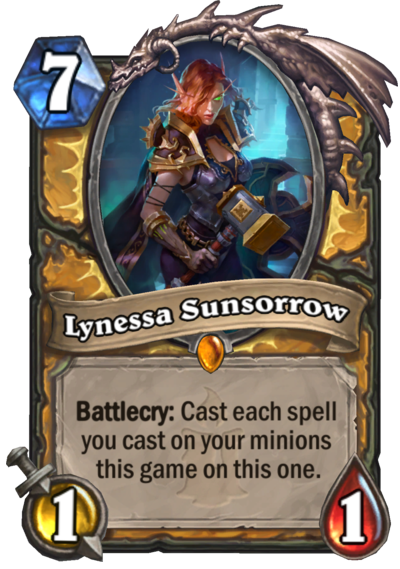 The other thing to note about Lynessa is that she's going to be the greatest punchline to some RNG jokes for the next couple of years. Evolve Shamans are going to let out some loud profanities if they Evolve any of their minions and wind up with a 1/1 Lynessa. And don't think that won't happen more often than not. Battlecry: Choose a basic Totem. Summon it. 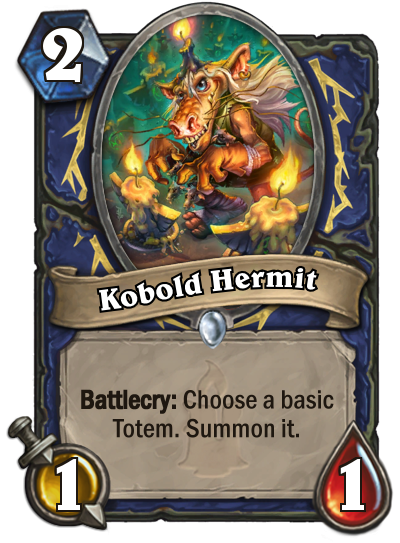 Analysis: Let's end on a trio of Shaman cards, starting with Kobold Hermit. This is a nice 2-mana drop with a decent Battlecry, essentially using the Shaman's Hero Power and adding a 1/1 body. Really, the only case against it is that it does eat up a precious deck slot. There are probably better cards out there that can be used in the 2-slot. The one case to pack it in is that it does provide two bodies for Evolve, but I wouldn't opt for using up a deck slot for this. If you do, though, at least you'll get a step closer to Thing from Below. Analysis: On the surface, Primal Talismans doesn't seem too threatening. Replacing a minion with a basic Totem doesn't seem too bad. But given that most Shaman decks like to run cheap minions like Fire Fly, getting an immediate summon upon death isn't too terrible. In fact, if it happens late in the game, it ensures that Bloodlust can still do some major damage. 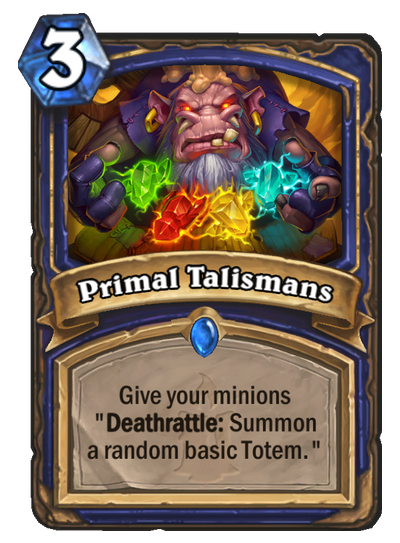 Analysis: Having played a lot of Shaman, I can say that getting all four Totems in play isn't a common occurence, but it does happen more often that one might think. And with the help of cards like Primal Talismans, it actually makes Windshear Stormcaller's effect entirely plausible to pull off. And at worst, this is just a vanilla 5/5 minion, which isn't awful. Here's the case against Windshear Stormcaller, though. Thrall, Deathseer has become a major cog to many Shaman decks. If the Death Knight has already been summoned, then it's extremely unlikely that the Shaman player will be able to pull off the condition to summon Al'Akir. So I wouldn't necessarily count on this card reliably over something like White Eyes. 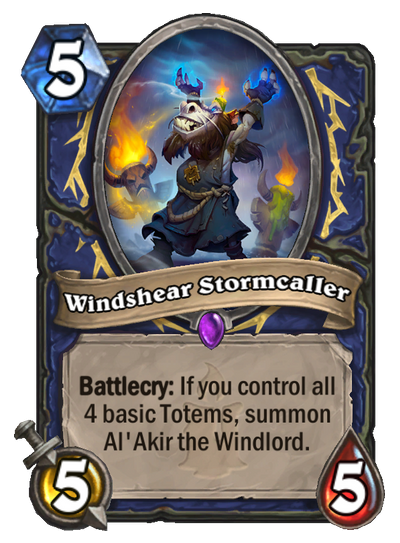 Of course, it should be noted that if the conditions are right, playing Windshear Stormcaller and getting Al'Akir and then playing the Death Knight has the potential to be a momentum-shifting play. It's unlikely to happen, but it's something that could be really cool to attempt in the expansion's first couple of days.